ALL-YOU-CAN-EAT crawfish ALL DAY boiled by 20+ teams competing for the 2014 "Best of Boil" championship title, 5 of New Orleans hottest bands, a juried artists' village, kid-friendly activities and more! 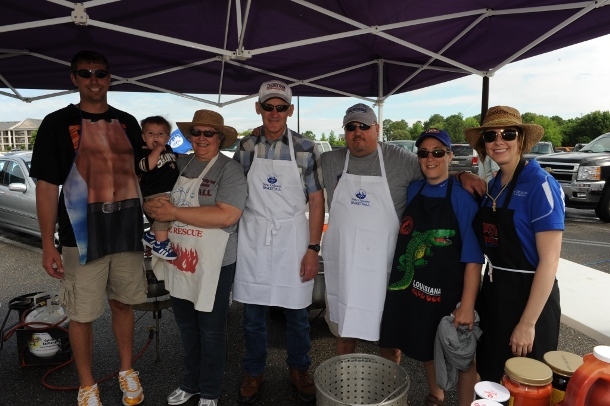 Whether you want to compete in the boil-off, taste dozens of different crawfish boil recipes, shake your money maker or shop the artists' village, you WILL want to be at our 3rd Annual Crawfish Mambo: Cook-Out & Music Festival on the Lake! Crawfish Mambo: Cook-off and Music Festival on the Lake started in 2012, the brain child of Brian Glorioso, 2011-2012 President of the University of New Orleans International Alumni Association. In launching the event, Glorioso's goal was to create an event that would achieve two of the Alumni Association's priority goals: build positive PR and relationships for the University and raise the funds needed to support professional development programs for UNO students like Dine Like a Professional Senior Etiquette Luncheon, resume review workshops, networking events, mentorships and scholarships. The success of the inaugural event (despite that day's torrential rain storm) wowed everyone, and Mambo is now the Association's primary fundraiser. But equally important is attracting new and old friends out (or back) to campus. We want the entire community to see how great UNO's campus looks. So, while Mambo is hosted by the UNO Alumni Association, the festival is for everyone! Everyone is welcome; we hope to make this festival part of the New Orleans festival canon. And really, what better way to celebrate and support a New Orleans' institution like UNO than by enjoying New Orleans' music and all-you-can-eat boiled crawfish? Office Hours: Monday-Friday 8 A.M. - 4.30 P.M.
© 2011 UNO International Alumni Association - All Rights Reserved.